Harold Grinden was a ski jumper in his youth but with his keen sense of organization, drifted into the administrative end as a young man. He was totally committed to the sport of skiing. Not one to seek recognition or honor, he served just for the satisfaction of serving the sport he loved. Harold Grinden was born in Duluth, Minnesota in 1903. He was a ski jumper in his youth but with his keen sense of organization he was engaged in the committee aspect of skiing by 1924. He served the Duluth Ski Club as its president and chairman six times, a number of years as club secretary and a long time as a member of the local club board of directors. He became active in the Central United States Ski Association in 1928 when first elected to office, serving six terms as president of the Central U.S. Ski Association and two years as vice-president. Grinden served the national association as president for two terms and six years as secretary. He was secretary of both the 1932 and 1936 Olympic Games Ski Committee and was an early member of the National Ski Patrol. Grinden had a long service record as a ski official and was recognized for years as an all events judge in the sport. He was a former president, secretary and treasurer of the CUSSA Ski Officials group. He created the “Flash Card System” used in open scoring of ski jumping competitions. He had more than 30 years of service as a volunteer ski jumping competitions announcer and was recognized nationally as an authority on the sport in general. He also had a long record of service in the development of junior skiing on a local, divisional and national level. In 1952 Grinden was honored by the Central U.S. Ski Association when the group awarded him with its divisional medal for outstanding service. In 1954 he received the Julius Blegen Award by the NSA for his contributions to the sport. Grinden was elected lifetime historian of the National Ski Association in 1935. It was one of his dreams that there should be a Hall of Fame to honor America’s ski greats. 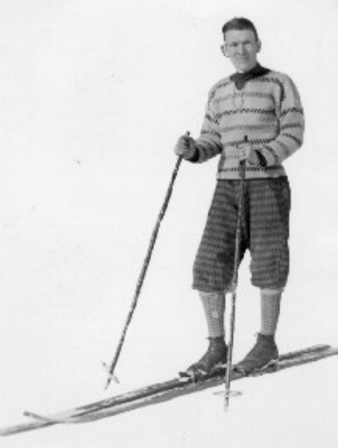 In 1941 it was Harold Grinden who first proposed that a national ski museum be established in Ishpeming, Michigan. He saw his dream established in 1954. In 1958 Harold Grinden was elected to the U.S. National Ski Hall of Fame. He was cited for his more than 30 years of devoted service to the sport of skiing on a local, divisional and national basis. If you notice any errors or inconsistencies in Harold A. Grinden's bio, click here to let us know.